Body odor is one of the sad realities of life. First invented by the French, majority of the civilized world now has a huge variety of not just hygiene products but also perfumes and fragrances available to help with masking our “natural” smells. But did you know that pet fragrances can assist our dogs, too? Finding the best dog cologne or deodorant for dogs, as it's called, isn't always easy because some of those pet perfumes may not work well for your Fido. Nevertheless, we've come a long way in expanding an assortment of dog grooming supplies in the last five years that have been very effecting at masking dog's poor smell. Dog cologne and pet deodorants are common products used in the dog grooming process nowadays. In fact, if you've ever had your pup professionally groomed at a pet groomer's studio, you've probably noticed that he has a very pleasant smell when you pick him up. * Click on the dog cologne brand for more information and prices. Alternatively, scroll below for more details. Why use a pet cologne or deodorant on dogs? 2) For dogs that have just been fully groomed and using one of the best dog colognes simply completes the task to the fullest. Your dog may have picked up a bad smell from running around outside, or from hanging out with other pets that are smellier than him. If you don't want the smell to continue to spread inside the house or your vehicle, a simple and quick dog cologne spray will fix issues with most smelly dogs. Before you go out on a search for the best dog cologne to make your own pooch smell like spring garden, there are a few things you need to learn about the safety of these products. Even though most of them are fine to use with dogs, some brands do not bide well with many dogs, according to their owners and many reviews online. You'll need to select a deodorant for dogs that is safe for your Fido. Buying dog grooming products scented with natural oils is the best idea, that way minimizing the amount of chemicals used. You also need to test the scent yourself before using it on dogs. What if the best dog cologne that you choose doesn't smell appealing to you? It's important. What Is the Best Dog Cologne & Dog Deodorant? Here’s one inexpensive pet grooming cologne and deodorizer from Lambert Kay that’s been on the market for over a decade now. It helps eliminate body odor in pets and keeps them smelling fresh and clean much longer between washes. There are 5 different scent varieties to choose from, all of which are available in 6- and 12-ounce sizes. The Fresh Floral Scent Cologne, a mild baby-like scent, acts as a pet deodorant that keeps body odor away for extended periods. This cologne supports handling of proper hygiene in pets. Lambert Kay’s Fresh ‘n Clean Cologne Spray is a must-have grooming aid for all dog owners, say many home and professional pet groomers. They claim that this best dog cologne works a lot better than most other brands – both as a deodorant and cologne. It nourishes skin and coat by controlling body odor that can lead to nasty smells. Buyers loved that their dogs smelled great for longer periods of time and were cleaner between baths. Not all buyers find the product’s scent to their liking, though. It was too strong for their dog, and they had to discard it straightaway. But the majority of users maintain that the Fresh Floral Scent is the best dog cologne for their dog because it is able to eliminate body odor in dogs, not simply cover it up. They say it maintains a fresher and nice smell on their dogs until the next bath. Wahl Doggie Deodorant offers 100% all-natural ingredients. It is composed of purified water, wheat protein, sugar cleanser, and eucalyptus and spearmint extracts, with natural oils. This best dog cologne uses only FDA- approved colors. It is formulated to deodorize and rejuvenate pet skin and coat. The natural oils found in this product help moisturize delicate skin and soften thick, long hairs in pets for easy grooming. It has a long-lasting fragrance that will leave your dog smelling fresh and clean up until the next wash. This product is well loved by many users. They like its fresh and clean smell and its soothing effect on the pet’s skin and coat. Some even use it to deodorize dog beds, mats and crates and find that Wahl 100% Natural Doggie Deodorant is really effective in removing doggie odor. A few buyers found this to be too mild to solve their doggie’s strong odor and opted to try a more potent product. They admit, though, that they like the mild scent and would alternate using this with the stronger deodorizer. Generally, customers like this for its clean and fine scent that worked well, especially for dogs and pet owners alike who are sensitive to heavily-scented colognes or deodorizers. Nature’s Specialties boasts of a great line of freshly-scented colognes (including this one) that are specially made for dogs and cats. The Foo-Foo Simply Plum Pet Cologne is formulated with natural ingredients, such as purified water, almond, coconut, and sweet plum essences. This spray is best for eliminating stinky dog odors, rejuvenating skin and deodorizing coats, and the quickest way to make pets smelling clean. Even grooming experts use this cologne in their salon because it makes their clients (both owners and pets) extremely happy. Its heavenly fragrance, they say, is light and pleasing which leaves pets smelling fresh and clean. Many reviewers even recommend spraying the cologne on the pet’s bed to make it more cozy and comfy. Nature's Specialties Foo-Foo Simply Plum Pet Cologne is easy on the pocket, and customers say it’s worth every penny. One recent reviewer finds this cologne great, except that he feels it is way too strong and the fragrance overwhelming. A few others agree, but these are probably extremely sensitive people because most buyers found this stuff to be lightly and pleasantly scented. The fruity and sweet smell of plum was generally well-liked by pet owners whose dogs were frequently outdoors. It worked well with active dogs and kept them smelling fresh even after long hours of chasing and playing around under the sun. This best dog cologne is formulated with natural deodorizing extracts to supplement Earthbath's high-quality shampoos. Blended with natural ingredients like aloe vera, meadowfoam seed oil, colloidal oatmeal, and vitamin E among others. It makes for a potent deodorizing spritz that soothes, conditions, and rejuvenates skin and coat. This product enhances show-quality luster and freshness. While this stuff is totally safe for dogs, its use is inappropriate for cats given that they’ll instantly lick (as is their nature) the spritz off, making it useless. This deodorizer is available in packs of 1, 2, and 6, and comes in various scents – this one being lavender. Users shared their happy experiences with Earthbath All Natural Deodorizing Spritz including one who had a two-fold success – the spritz kept her dogs mighty clean and fresh smelling, and surprisingly healed her dogs’ dandruff and itching ailments. The trick she said was to use a combination of Eartbath’s line of shampoo, conditioner, and this Deodorizing Spritz! Others also noted that it made a difference to them that this product is 100% biodegradable. One user, however, describes the scent of this product as very overpowering and keeps his dog sneezing after each application. Generally, buyers were impressed by this product. While this spritz does not come forward as a solution to skin issues, many users were happily surprised when it addressed not only dog odors but also itching, dandruff, and other mild skin conditions. Dry and irritable skin conditions usually require specialized treatment, but with this oil-enhanced conditioning mist by Isle of Dogs, pet owners can do away with such costly procedure. This conditioner provides a rich blend of evening primrose oil and natural herbal extracts that help relieve dryness and reduce skin flaking by hydrating cells responsible for oil stability in pets. Using this product regularly helps in rejuvenating the dog’s skin, removes nasty odor, and leaves a soft luster to the dog’s coat. The Maldives Villa fragrance is favored for its subtle and elegant scent. Customers found Isle of Dogs Coature No. 62 Evening Primrose Oil Conditioning Mist a great way to comb through tangles and deodorize their dogs at the same time. It made wonders even on matted hair, and that means the world to a busy pet owner. The heavenly fragrance also made a lasting impression on first-time users. Even with the product’s impressive qualities, a customer felt it was way too strong for his dog with overly sensitive skin, adding that the fur in double-coated breeds ends up getting messier and harder to brush. Nonetheless, majority of the users found this to be the best dog cologne and conditioner for their pet. It’s the grooming aid that they need to keep their dogs smelling fresh and looking shiny, not to mention the added benefit of solving tangles and flakes. This is one of the most popular best dog deodorant options from the Gerrard Larriett Aromatherapy Pet Care company. 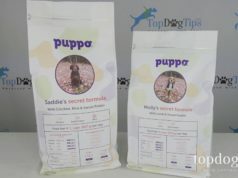 The product quickly rose in ranks due to its effectiveness and because it was covered in some of the more popular pet publications, such as Modern Dog Magazine and Cesar Way Magazine. Another very popular product among the best dog deodorizer choices, this brand from Crazy Dog has two very appealing and unique smells available – Pina Colada and Green Apple, with a mix of coconut in between. This dog grooming spray is one of the most long lasting pet odor eliminators that also cleans the dog's coat and soothes the skin. This is the most popular type of pet odor eliminator scent – baby powder scent – made for Fresh'n Clean's best dog deodorizer, formulated with their proprietary technology that also contains proteins to protect, repair and strengthen the dog's coat. In addition, it also contains vitamin E, aloe and lanolin, all of which help to moisturize and condition the dog's fur and coat. Baby powder scent is the most popular choice among the best dog cologne choices, but this brand from Bodhi Dog brought a little spin to their own new dog deodorizer – it removes the naturally unpleasant scents but leaves only a hit of a baby powder scent, just enough to make the dog smell clean rather than sprayed. A completely new brand on the line among the best dog deodorant products, this brand from Nootie is proving itself as a decent alternative albeit not very original. While pet owners who've tested this dog deodorizer found the smell and product effective, for the price there are simply better options than this one. Here is an original option among the rest of the best dog cologne products – Honeydew's 2-in-1 flea repellent and dog deodorizer/dog grooming spray. The formula is gentle and safe for dogs; however, the effectiveness of both the pet odor eliminator part and the flea repellent aren't up to par. It's better to choose just one. Espree Animal Products have been in the dog grooming supplies market for a while, but their alternative best dog deodorant is a new product in their line. So far, this seems like a good option and is marketed as the most appropriate best dog deodorizer for puppies. It's slightly more gentle than other brands; however, the cost is slightly higher than most products. One of the cheapest best dog deodorizer options out there, Top Performance offers their new product at a much more affordable price than any other brand among the top best dog cologne products. However, while the smell of this pet odor eliminator is naturally good, it doesn't last as long as most other brands. Oster is one of the better known brands in the dog grooming supplies market, and this second to last best dog deodorizer is fairly good at what it does but it costs more, and there are better, more affordable products available. The fragrance is odd and fake smelling, but it does last a long time. Other than that, there's really nothing special about this brand. The last on the list of alternative best dog cologne products, the Perfect Coat deodorant for dogs is made using the most popular scent, baby powder, and the formulation itself is pretty standard. It's an affordable dog odor eliminator in the mid-price range, but for that same price there are better products available which we reviewed above. Now it's your turn. Have you tried any of the above listed best dog cologne products and deodorant for dogs? Which one did you like the most and which one did your pet prefer? Let us know in the comments!